Sweet potatoes—A few extra for everyone. We have a lot to use up and we’re nearing the end of the season! Broccoli—Crunchy and vibrant. When this crop is frosted it turns purple, but it will be bright green when you cook it. Cauliflower—While not perfectly white, this cauliflower is really excellent! It’s much harder to grow than broccoli, so we don’t get as much of it and when we have a good stand, we’re really excited. We hope you like it. Cabbage—Large shares received a nice head or two of green cabbage. We made a wonderful cabbage dish this week of smoked venison sausage, potatoes, apples, a bit on onion and loads of garlic, all slow cooked in a big dutch oven. Leafy Greens—mixed brassica greens, a variety of kales and collards. Acorn Squash—Just about the last of these tasty fellas. Delicata Squash—Small shares received this type. Delicata are a wonderful, highly prized variety our chef clients love. These have been a big hit stuffed with pork sausage, onion, celery, apples, and pecans. Heirloom pumpkins—Large shares. A wide array of varieties went out today. I recommend cutting in half, scooping out seeds, roasting upside down, and then scooping out flesh into 2 cup freezer containers for use in pasta or baking all winter. We’ve stockpiled a good bit at the farm and these pumpkins are delicious. Mixed Turnips—Mixed bags of purple top, scarlet queen, and hakurei turnips. Boil, then butter and salt ’em. Mmmm! Sweet potatoes will prefer to stay at room temp. Everything else will keep longest stored in the fridge sealed up in a bag. All root crops should be severed from their tops to keep the roots from getting rubbery. Everything will need a gentle washing before cooking, but leave the dirt on until you’re ready to use them to prevent spoilage. 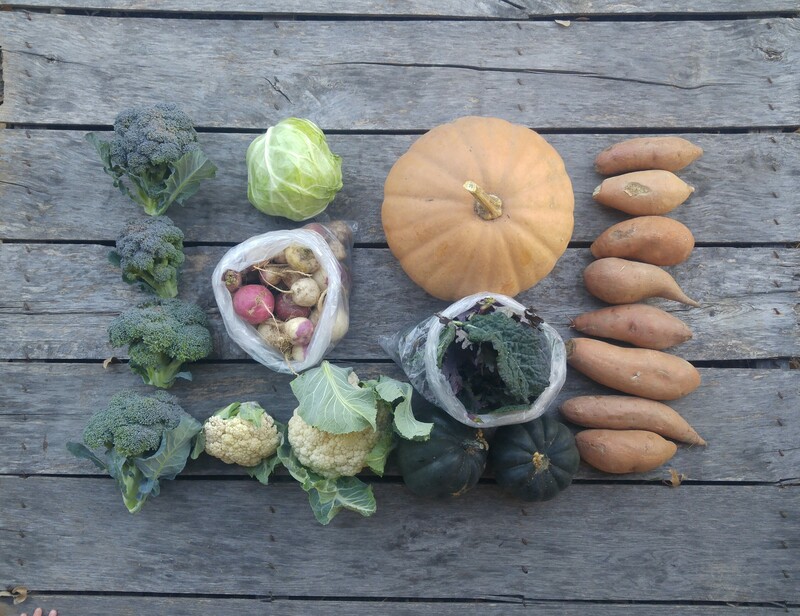 Large Share: (top left to right) Broccoli, cabbage, heirloom pumpkin (this one is Tan Cheese), sweet potatoes, bagged mixed turnips, bagged mixed brassica greens, cauliflower and acorn squash. 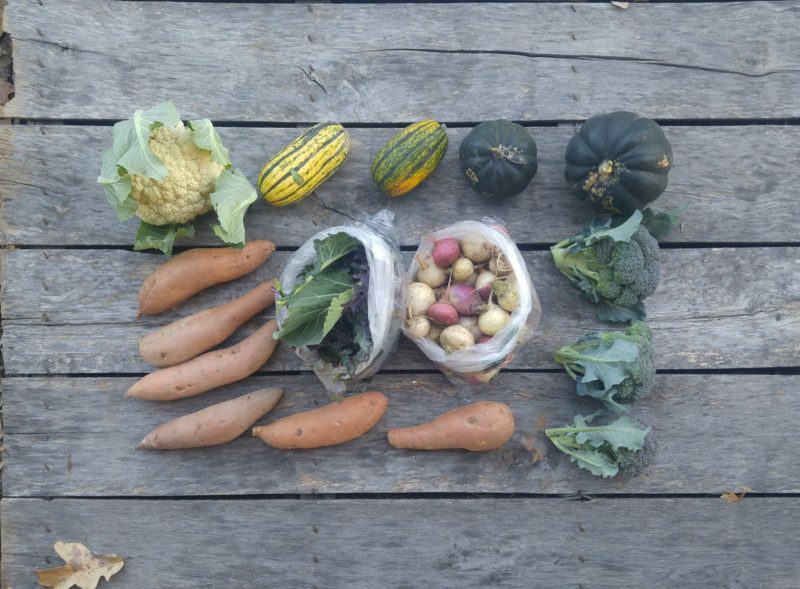 Small share: (top left to right) Cauliflower, delicata squash, acorn squash, sweet potatoes, brassica greens, turnips, broccoli.